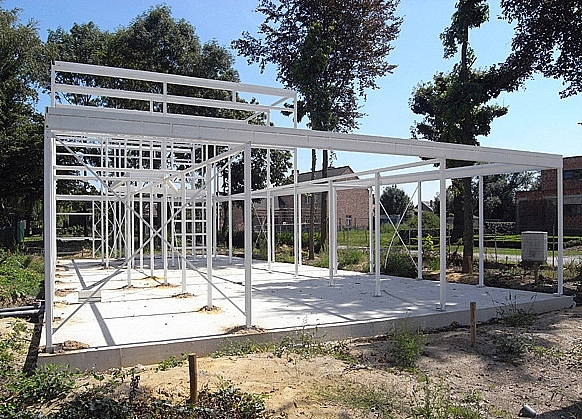 A lightweight structure would appear to be an obvious choice to reduce the environmental impact of a building. Savings are made on materials, and thus on raw materials and energy for producing the materials, transport and waste. The low thermal mass of a lightweight structure need not stand in the way of this decision. All the more so, because it is now easy to increase the thermal mass of a lightweight structure using Phase Change Materials (PCM). A PCM is a material that absorbs and emits thermal energy by changing phase. When the material melts it absorbs heat and when it solidifies, it gives off heat. PCMs - usually paraffin waxes or salt hydrates – they can be added to the construction material, e.g. incorporating paraffin wax beads in a concrete deck of a composite slab floor. This increases the thermal mass of the structural material and at the same time saves on materials for the structure. The structure is thermally heavy, but is limited in mass and weight. 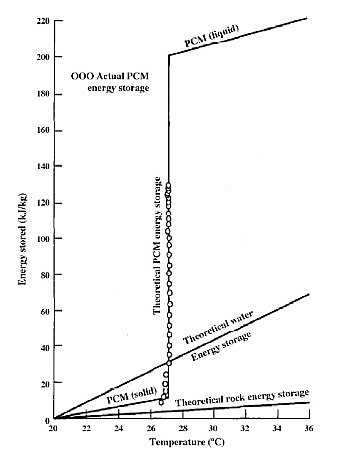 Comparison between the thermal energy storage of conventional materials such as water and stone and PCMs. In lightweight structures a PCM can certainly store a lot of heat and cold. PCMs change phase at around 27°C. In the transition from the solid to the liquid phase they absorb heat from the building and store it. The cooling effect that amounts to about 4°C is often sufficient to maintain the interior temperature pleasantly constant. In the transition from liquid to solid the heat is released and the building is warmed up by about 4°C. During the phase changes, the temperature of the PCM itself remains almost constant. The melting and solidification (or crystallization) of a PCM can in principle happen repeatedly for an indefinite period without having any affect on its physical and chemical properties. Incorporating PCM in a structural or building material, e.g., a wall, facade cladding or a floor deck, produces a buffer that can hold heat for a longer period of time (heat-accumulating capacity). The heat is extracted through openings in the buffer via a transfer medium, e.g. airflow. Hardly any energy is needed to move heat to and from the PCM.